John Mendoza is a longtime professional magician who has created an outstanding repertoire of close-up magic that he used to tour with throughout the world. 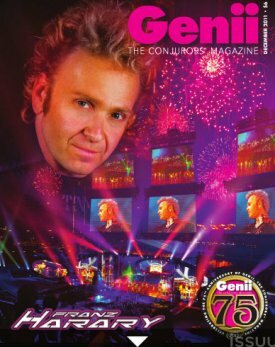 On this DVD he is captured during a live lecture where he performs and teaches many of his best routines. 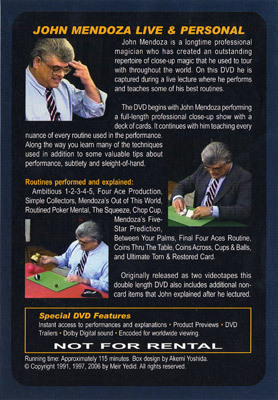 The DVD begins with John Mendoza performing a full-length professional close-up show with a deck of cards. It continues with him teaching every nuance of every routine used in the performance. Along the way you learn many of the techniques used in addition to some valuable tips about performance, subtlety and sleight-of-hand. Ambitious 1-2-3-4-5: A spectator names any small number. You shuffle the cards face up and face down. Upon spreading the cards they are seen to be all facing the same way except for a four-of-a-kind matching the named value. Four Ace Production: After a few shuffles the four aces appear in a visual display. Simple Collectors: Three selected cards are lost in the deck and are instantly found interlaced between the four aces, which have been in full view. Mendoza's Out of This World: A spectator deals a deck into two random piles. When the cards are spread face up they are seen separated into reds and blacks. The Squeeze: A gambling demonstration where the cards are continuously shuffled but after each shuffle are shown to still be separated into reds and blacks. Routined Poker Mental: Four Poker hands are dealt to four spectators. Each person thinks of one of the cards in their hand. You now divine the cards they are thinking of. Between Your Palms: Two selected cards are lost in the deck but when you have trouble finding them, they are found under the spectator's hand. Final Four Aces Routine: An ace assembly routine that is repeated three times with each version more impossible than the previous. Mendoza's Five-Star Prediction: A card is selected under extremely fair conditions but still matches your prediction. Coins Thru The Table: A multi-phase coin routine where seven coins continuously appear to penetrate through the center of the table. As a surprise finale a giant drill bit is produced. Chop Cup: A one-cup and ball routine where the spectator tries to guess where the ball is. As a finale two large balls are produced from under the cup. Coins Across: A quick and direct routine where four coins vanish from one fist and magically appear in the other. Cups & Balls: A handling of Vernon's Cups & Balls routine with some new moves and ideas. Ultimate Torn & Restored Card: A double-signed card is torn into eights as seven of the pieces immediately fuse together to match the remaining piece. Previously released as two videotapes this double length DVD also includes additional non-card items that John explained during and after the lecture.